I wanted to update the Beagles and Buddies family on our wonderful adoptee, Hershey. 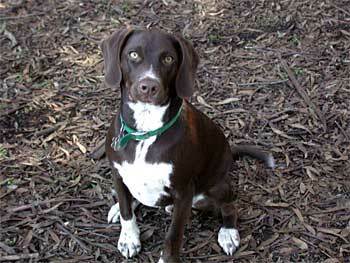 He came to our home in January, 2002 to replace a dearly beloved daschund that had passed away right before New Year's. He was 8 weeks old when he arrived at our home in Woodland Hills. Since that time, not a day goes by that we don't brag about him - at work, at the off leash park, you name it! 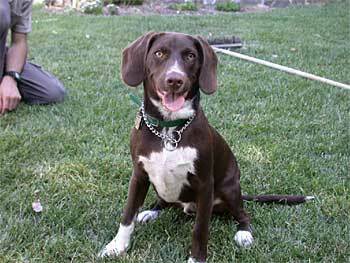 Hershey has become a devoted companion and playmate to our entire family. He enjoys lots of love and attention. We've kept him lean by mixing his food with fresh vegetables (since beagles have a tendency to put on the pounds) and lots of fresh air and exercise at the off leash park. Hershey has proven himself to be very talented in one special way - if you ask him to "Pavarotti" he will sing for you! Here's some pictures for you to enjoy. Thank you for allowing Hershey to be part of our family. We are truly lucky!